The Ethernet-AVB Verification IP is compliant with IEEE 802.3 and IEEE 1722 specifications. Ethernet Audio Video Bridging is an emerging IEEE 802.1 standard designed by Audio Video Bridging (AVB) group to provide a reliable, high quality of service and low latency solution for streaming media. It can work with SystemVerilog,Vera, SystemC, E and Verilog HDL environment. 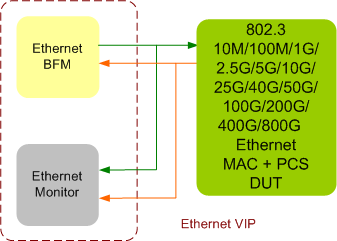 Ethernet-AVB VIP is developed by experts in Ethernet, who have developed ethernet products in companies like Intel, Cortina-Systems, Emulex, Cisco. We know what it takes to verify a ethernet product. Supports all types of TX and RX errors insertion/detection at each layer. SmartDV's Ethernet-AVB Verification env contains following. Complete regression suite (UNH) containing all the Ethernet-AVB testcases. Examples showing how to connect various components, and usage of TXRX BFM and Monitor.